Note: I have no connection, whatsoever, to any of the companies which produce the products I rave about here. They have no idea who I am and I receive nothing from them. Dr. Miracle’s Stimulating Moisturizing Gro Oil. Let me tell you, this stuff is awesome. We’ve been using it once a week, after our “deep clean routine.” K, O, and M all love a good bath and they take lots of them all week long. But on Sunday nights we do long soaking baths for all three kids, including serious scrubbing and bubbling and heavy duty cleansing. We wash K & O’s hair at least twice and then do a heavy conditioner that we leave in for as long as possible before rinsing out. And then (after clipping 30 fingernails and 30 toenails and cleaning 6 little ears with Q-tips and –for K & O– heavy lotion from head to toe) we do a leave-in oil treatment. We’ve tried a bunch of oils over the years. Right now, this Dr. Miracle’s Stimulating Moisturizing Gro Oil is our favorite. It has a tingling sensation on the scalp that the boys love (I mean, they love love love it!). It makes their hair smell good all week long (even if we wash once or twice in between, which we almost always do). And– best of all– it works miracles (seriously! this “Dr. Miracle” is a miracle!). In a relatively very short amount of time post-pool-closing, K & O’s locs are looking good. If I do say so myself: healthy, shiny, bouncy, vibrant. No kidding. This stuff is seriously a miracle! LOVE IT!! Organic Root Stimulator Olive Oil Nourishing Sheen Spray. K & O love to use a daily sheen spray. They always have. And, while I don’t think it is necessary at all, I have to admit that it does make their hair look really good! So, I indulge them in their love-affair with the sheen spray each morning. For at least three years now they’ve been excitedly calling it “car wash!” when their hair gets immersed in the cloud of mist from the can. They are now old enough to be trusted to spray each others hair somewhat responsibly (most days), so I’ve been letting them take turns spraying the sheen spray on each other (photo at top). Over time we’ve tried a few brands and I must say, this one is our favorite so far. The fragrance is not overwhelming, the mist is very light, there appears to be virtually no ‘build up’ over the course of the week, and the results are great: their hair looks nice and shiny all day long. Really good! c. Booth Tahitian Monoi Dry Oil Spray by Delicious Brands LLC. This is a a very sheer pump-spray oil that goes on light right onto the skin. We’ve been using this on K & O’s faces each day before school, instead of a cream lotion. It is just enough to give their faces the moisture that they need, without a heavy or greasy look/feel. And it smells wonderful. The boys love to use this and much prefer it to lotion on their faces. A little goes a long way (we’ve been working on the same bottle for a few weeks now and we’ve still only gone through half the bottle). Just one or two sprays per face, then a quick spread-it-around-and-rub-it-in, is all we need for all-day-healthy-looking faces. It makes their skin glow like scrumptious-looking caramel. Really. I could go on and on raving, but I’ll leave it at that. So, throwing it back at ya!— Do you have a beautiful black child’s hair and skin to care for? If yes, what are your current faves? Thanks for the tips. I am always at a loss for the right combo for seriously dry skin season. To top it off. Reece has eczema which compounds the problems. Thanks for the suggestions. Right now I’m loving some of the curly q’s stuff for hair- but I use alot of my own concoction of oils/butters etc. Just a quick FYI- with the very mild winter last year- not only are fleas and ticks uber prolific… so is the LICE! Throw some tea tree oil in what ever you are leaving on their hair. The little buggers (bugs) don’t like it. Do you do the boys’ hair yourself or do you have their locs professionally done? I’m growing out my son’s hair and I am at an absolute loss as to what to do as he has very tight curls. I was thinking twists or locs but will have to go to a black hair salon to have them done as Italian hairdressers have no clue how to deal with them. face: sometimes the above, especially in winter. What we like to use for their face as well is L’Occitane’s mum & baby skin care. hair: Davidson has very short hair, so we wash his hair with the products we use for Léane and then just rub a bit of the whipped sheabutter into his hair. For Léane I absolutely LOVE the Bee Mine , especially the luscious moisturizer and the avocado conditioner. Since I try to give her a new hair style every 2 weeks at the latest (sometimes every week), I also need a good styling cream, which is either the Bee Mine curly butter or Darcy’s Botanicals Madagascar Vanilla cream. Looking forward to reading about the experiences of other moms & dads. I have been moving more towards natural products. 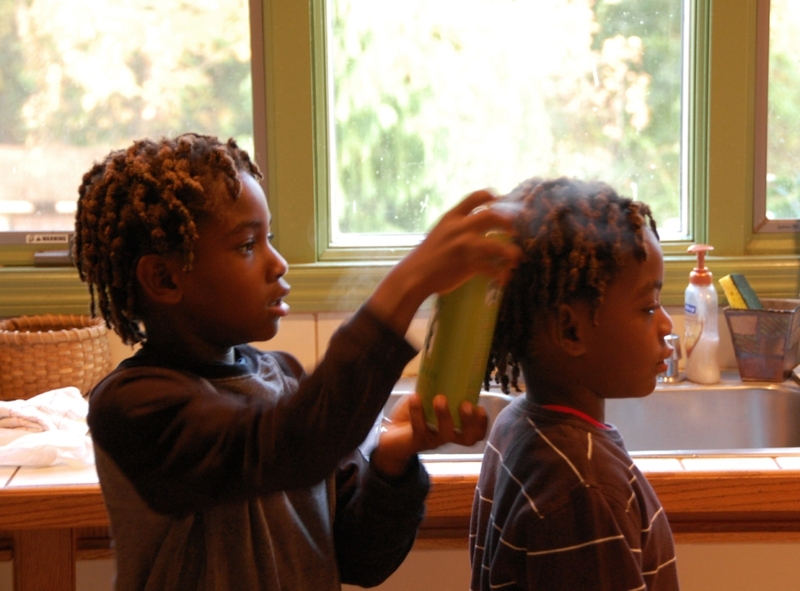 The girls (and now the boy, who I have just started locs on) get their hair deep washed and conditioned once a month. I start with apple cider vinegar (mixed with 2/3 water) and soak their hair with that. It gets rid of build up, lint, cat hair. Rinse well and then I wash with a balancing shampoo and watered down conditioner. For daily moisturizing of skin and hair, I use organic, unrefined coconut oil. In the winter, I mix this with Carol’s Daughter body jelly (a natural version of vaseline), or coco butter (burt’s bees). With my son, since I am twisting his baby locs, I use a spray bottle mix of olive oil and water and then a bit jamaican mano and lime loc gel. With the girls, since I latch their hair, I don’t use any gel. Occasionally, I use jamaican mago and lime no itch grow spray on their roots. During the week, we mainly do showers and they get a light hair wash once a week or once every 2 weeks. But, their hair is soaked with water almost every day. Ok, that should be mango and lime gel…..I need more coffee. Thanks Heather! I forgot to mention the products we use for Abe. I use a European line of products called BIONIKE and especially a body moisturizing cream called PROXERA that is perfume-free, and free of all the usual gunk you find in normal products. For his face we use a product called NO-ALL DERMA, I believe it’s manufactured by ROTTAPHARM, same kind of idea, free of perfumes, nickel-free, etc. They are expensive products, but I tried all the products from Nivea, and other similar lines, these are the ones who work best for us. For his hair I use baby shampoo or one of the bath gels from the Bionike line as he washes his hair minimum 5 x a week (2 soccer practices, 2 swim lessons, one soccer game per week). We use a conditioner that my hairdresser gave me. I have sheabutter from Africa, but it takes too long to melt it down and I don’t really like the oilyness (spelling…been living in Italy too too long). I have a good AVEDA styling cream that I plan to use when I try to finally do something different with his hair. We use Carols Daughters hair balm and sometimes the vanilla leave in spray. Deep condition with trader joes line mixed with olive oil and skin trip body lotion. Love that you shared and will try some of these as soon as what I am using stops working (I find that after a while, things just go funky and stop doing what they are supposed to- murphy’s law kicking in?? Right now, I do NOT wash Malia’s hair in the traditional sense- I throw in conditioner while dry, then after a while of playing in the tub, I have her lay in the water, head fully immersed while I work my fingers through and rub her scalp. The she is reconditioned and resoaked. At comb out, we put in a good amount of KLM California curl balm and comb with a kikikaka brush (NOTHING else will do!!) from tip to root, rather than the other way around. At night, I always bind her hair in some way and she sleeps on a satin pillow case. In the morning, the binding comes out and her hair is sprayed with a mix of water, conditioner and olive oil, styled and a frizz oil added. Voilá! we LOVE taliah wajjid protective mist bodifier…mixed with water 1/3 TW to 2/3 water…sprayed 2x a day every day all yr long…when we wash we do a co wash..we NEVER use shampoo..it just dries her hair right out..I just use whatever conditioner I’ve picked up for dry hair or curly hair. I put it in a hair dye bottle and squirt it directly onto the scalp and massage it into the scalp only and them rinse and it pulls all the gunk out. Right now we’ve had yarn extensions in for 6 weeks and I think we’ll get another 2 ish weeks out of them. As for lotion, thick in the winter thin(er) in the summer..EVERY.SINGLE.DAY all yr long..or we have a stick of chalk!! I found some amazing organic body butter (pomegranate scent) at the local dollar store and we love it. I am a convert to pure coconut oil – as a moisturizer for hair & skin. My son likes his hair pretty short, so it might not work as well for kids with longer hair (or different hair type for that matter) but it’s great on him – virtually no scent, doesn’t leave his hair greasy, but shiny & soft. It’s great for his skin too, keeps it from getting ashy even in our ridiculously cold & dry winters. I have been using the Organic Root Stimulator Olive Oil Nourishing Sheen Spray for about 8 months and I love it for my hair, but be careful because the oil can sometimes break be harsh if you have sensitive skin around your ears or neck like myself. For shampoo I use BioInfusion Olive Oil Conditioning Shampoo. You can get it at any Walgreens and it works better than any shampoo I’ve ever used including Carol’s Daugher and Paul Mitchell’s Tea Tree shampoo (which I always thought was kinda an oxymoron). After I deep condition and twist my dreads, I tie my hair up with a satin or silk scarf so I can keep the moisture in and keep my locs from pulling and rubbing out. Ah – perfect timing! We’re letting B’s hair grow out for a bit (kept it really short this summer), so I’m looking for new products. Thanks! I tried another product on my son’s hair – LUSTER S CURL, that I had previously tried…big no- no! He developed eczema due to allergies to the product and the dermatologist put him on antihistamines for 7 days, Cortisone for 2 days and a mix of cortisone and another cream on his neck where he broke out for 4 days. The dermatologist said that even if I had used the product before, allergies usually show up in the subsequent times you use it. It’s in the garbage now… we checked the ingredients and 4 ingredients were on the allergy list…who knew? Now at school they have a lice problem, so no locs, no long hair, he’s getting a haircut this week. Best of luck and lots of love to your family!